Alpari Companies Group was launched in 1998. To this date, Alpari is one of the companies rendering on-line trading services in Russia. Alpari Broker provides trading services in the international currency market Forex and CFDs on shares, futures and stock market indexes. Alpari's activity is regulated by the Financial Regulation Agency (KROUFR). I try many broker, I choice Alpari at last. Opened an account with them and minimum deposit of 200$ to test them. Although I’ve tried some volatile market trades both was extremely good at order fills. waiting for this Friday for my third attempt. Stops and Take Profits are triggered correctly, slippage within 3-4 pips. Finally, when I reached 360$ I decided to withdraw 150$ from my profit, After 4 hours later I’ve got my money. I hope next time it will be the same level. I trading in Alpari for almost 3 years and never faced any issues while trading because this broker has a reliable platform for every trader so far. I have made more than 100 trades so far and currently making money on this broker so easy because they provide easy and fast trading system. The bonus and profit always about 30% in every trading and they have safe payment system, as all of my withdrawal happen within real time via Credit/Debit Cards about 3 to 8 working hours. It's worth it to invest with this brokers and I am really glad to be one of Alpari client. Everyone, you are should trade here and get ton of money. Trading experience is really convenient. I have been working with him quite a long time, and he is quite happy with me. I was quite pleased with the trading experience. In my opinion, this is quite easy to work with, which can really bring a very good profit. I have an account with Alpari for more than 2 years now, I have made several profit withdrawals so far, however they went smoothly and reaches my skrill account on the next working day. The execution of orders is good with lowest spreads and competitive leverage. I've only been with Alpari for two months, so far I'm very happy with them. Instant fills, and executions. Even have had orders executed during news economic events with excellent fills. I have open more than 200 trades in their platform and only 1 of my order get slippage only 13 pips. During this two months my I have earned profit of $536 from $200 initial deposit. Beginning of this month I withdraw my profit for 1st time. I withdraw $350 of the current balance by Webmoney and I was surprised that my money was arrived within 4 hours. I feel safer with this broker. 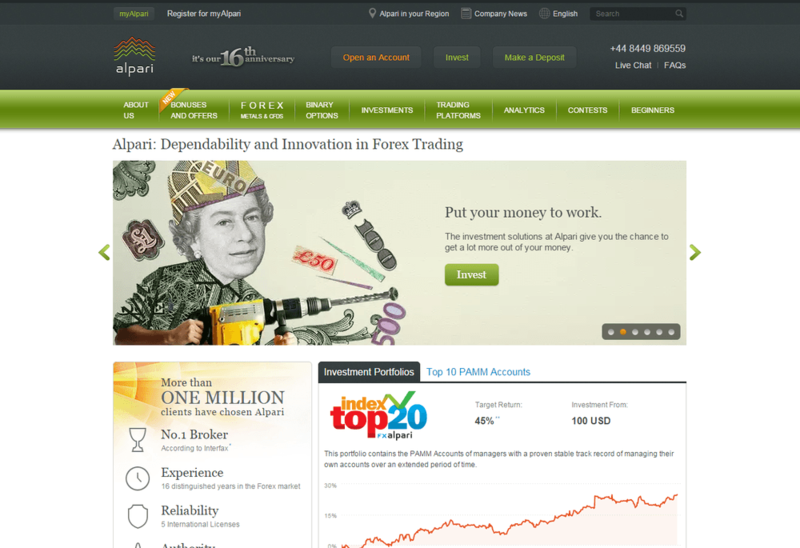 Alpari is one of the best forex brokers I ever trade with. They provides trading services in the international currency market Forex. I've been trading with them for more than two years and my experiences has been excellent. I use the MetaTrader 4 platform and works with the execution type which processes an order always on time and at the best market price with real time prices event though in the news release. I like their trading conditions with spread from 0.5 for EUR/USD so every month I deposit currency pairs about $350 to $500, it is greater than thetheir minimum account size and I have made so far 65% profit in 2 years. I didn't had problems with withdraw profit process, it took about 8h to get the approval. It is great. Alpari is a reliable trading broker. I trade with Alpari for a couple of months and I like their service. The platform MT 4 works with instant execution of trades and real time prices, the broker is not manipulating the prices during volatility times. My first deposit was 200$. I made a nice profit during my first month 625$. To withdraw money is easy and is commission free. I use WebMoney to withdraw and deposit and I never had problems. When I first joined them I also applied for 100% bonus back. I trade with them currency pairs EUR/USD, USD/CAD, USD/JPY, USD/CHF, GBP/USD, and recently I from now I will trade also cryptocurrency in BinaryTrade Platform. I recommend the broker because is honest and doesn't have hidden commissions. I have nothing bad to say about Alpari. It's a broker you can totally trust. My first deposit was of $150 because I didn't have more money. I had several debts to pay off and I was in a desperate situation. But one day, I received a call from one of its representatives encouraging me to open an account and start to trade with a minimum deposit. This person was really helpful and patient with me. He explained me every detail of Forex market and how Alpari could help me. For my deposit, he gave me a bonus of $100 without verification of my account. Also, I took a training course where I learnt a lot. After 6 months practicing in a demo account, I switched to a real account, where I got $200 after 2 weeks of trading with EURUSD. I tried with different pairs and my earnings were raising as the time went by. Now my balance is $3,500 and thanks to this broker, I could pay off my debts. I trade from my home, my mobile or my tablet (Alpari provides the trading platform for different devices) with excellent results. It has been 1 year using Alpari forex and along the journey with them I experienced up and down towards successful goal. To be real, it was not easy to maintain profitable trades for all the time and seriously I believe that never expect and assume price movement in the market. I also don’t dumbed big amount of money so $200 was a good start for me with Alpari also they gave me welcome bonus of 100%. I experienced the platform is well and workable, eased all charting activities without data or price manipulation. I prefer EUR/USD and USD/JPY and it has been my favorite pairs to trade. If about to withdraw profit definitely Unionpay would be great less than 3 days I can see money credited into account. Thanks for the superb services Alpari and keep it up!